Place the cream and condensed milk in a small saucepan over low heat and stir until just warm. Set aside and keep warm. Place the corn syrup, sugar and water in a medium saucepan over high heat and stir until the sugar is dissolved. Insert a sugar thermometer, bring to the boil and cook until the temperature reaches 120ºC (250ºF). Reduce heat to medium, add the butter and warm cream mixture (the temperature will drop on the thermometer) and cook, stirring continuously to ensure the mixture does not stick, until the temperature returns to 120ºC (250ºF). 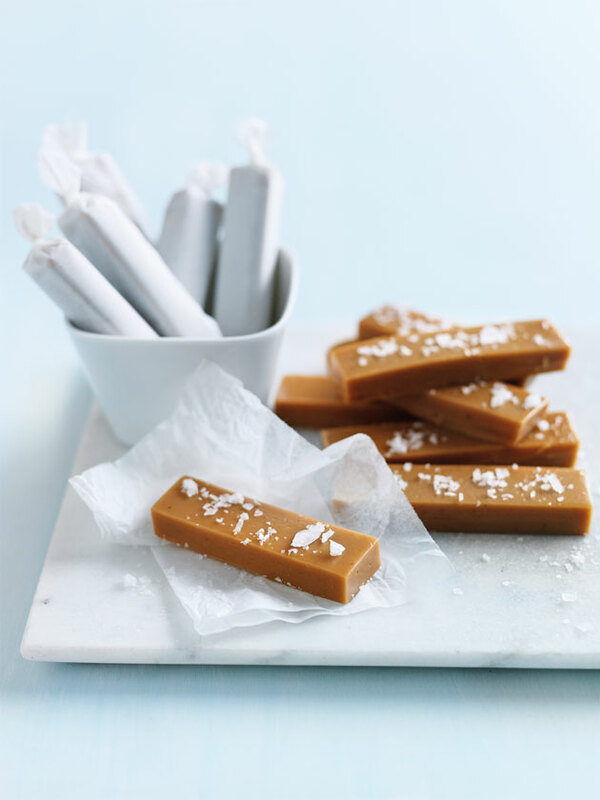 Remove the caramel from the heat and pour onto a well-greased 20cm-square baking tray. Sprinkle with the salt and allow to cool completely. Do not refrigerate. Turn caramel out and cut into thin fingers. Wrap in non-stick baking paper to serve. Makes 36. Hi-we do not have double cream in my area—is there a substitute? How long will these keep for? What is the best way to store them? I’m having trouble finding corn syrup, is there a substitute?